What could be more humiliating than to be stripped of your garments before your own mother and friends and then to be hung upon a cross to die. 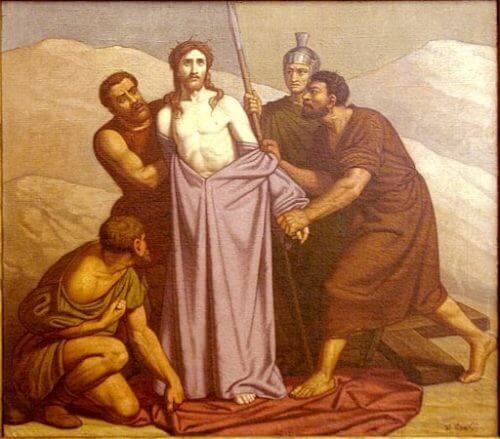 But Jesus was stripped of His garments for a reason. Everything earthly had been freely sacrificed by Him and He died with nothing of His own in this world. His sacred flesh revealed the dignity of His sacred soul which was loved and adored by His dear mother. As our Blessed Mother stood before the Cross gazing at her Son after they had stripped Him of His garments, she would have been reminded of the day of His birth when He came into the world with nothing. And she may have recalled the words from Scripture spoken by Job, “Naked I came forth from my mother’s womb, and naked shall I go back there. The LORD gave and the LORD has taken away; blessed be the name of the LORD!” (Job 1:21) Our Blessed Mother witnessed the very beginning of Jesus’ earthly life and now was witnessing the very end. The stripping of our Lord’s garments revealed that the sacredness of His life was not in what He obtained or had as a possession; rather, the sacredness and value of His life was solely about who He was. He was God in the flesh, God incarnate, the Second Person of the Most Holy Trinity in bodily form. In His flesh was the unity of God and man and our Blessed Mother was privileged to witness this reality of the Incarnation one last time as Jesus hung upon the Cross. She gazed at Him and beheld God in the flesh. We must strive to learn a lesson from the stripped body of our blessed Savior as He hung upon the Cross before His mother and before the world. Just like Jesus, our dignity comes from our union with God. We have value and worth not as a result of what we accomplish or obtain in this life. Rather, we have dignity because we have allowed the God of Heaven to come to Earth and enter into our own flesh and blood. Our dignity is on account of the continuation of the Incarnation of God alive in our lives. Reflect, today, upon the most sacred image adored by our Blessed Mother. Join her in adoring the sacred dignity of her Son, the Son of God and the Son of Man. Recognize that Jesus’ Incarnation also raised you to the heights of Heaven and strive to see the presence of the Son of God alive in your own life. My dearest Mother, you stood before the Cross of your Son adoring His bruised and beaten body. This was the same body that had come forth into the world from your own sacred womb. Now this Child of yours was once again stripped bare in your sight. But as you gazed at Him, once again, you saw what you had seen every day of His life. You saw God in the flesh. My dear Mother, pray for me that I may always see the dignity of others not on account of what they have or what they accomplish, but on account of who they are. Help me to see all people as sons and daughters of our loving God in Heaven. My precious Lord, I invite You, this day and always, to unite Yourself to me. Come live within me and make my heart and soul, my flesh and bones, a continuing presence of Your Incarnation. Help me to see the dignity I obtain in life by becoming one with You.